NOTES ON JAZZ: Atlanta Drummer Dave Potter's "You Already Know"
The Atlanta based drummer, Dave Potter, has recently released an album, You Already Know, on Summit Records, and this auspicious debut is making its way up the jazz charts. On this album he proves he has absorbed the tradition and developed a powerful sense of swing that he carries to any band that he plays with. Potter, a graduate from Florida State University’s Jazz Studies program, studied with the pianist Marcus Roberts. After graduating in 2005 he was chosen to work in The Louis Armstrong Quintet at The University of New Orleans, but his stay in Louisiana was cut short when hurricane Katrina hit the Crescent City. In 2006 he was awarded a scholarship to prestigious Julliard School of Music to continue his studies, but instead chose to return to his alma mater to get his master’s degree, which he completed in 2008. Along the way Potter has enjoyed working closely with Roberts, a mentor, both at school and in the pianist’s working trio. The drummer caught the discerning eye of Robert's drummer/percussionist Jason Marsalis and Potter began working and touring with him in 2009. Since Marsalis began playing the vibraphone more regularly, Potter has taken over the drum chair and can be heard on two of Marsalis’ recordings Music Update and 21st Century Trad Band. On You Already Know, Potter has chosen to use three distinct rhythm sections, each made up a stellar cast of musicians, that in concert realize his musical vision. The ease with which he adapts to these three different bands is a testimony to his versatility as accomplished drummer. He molds himself to the need of whatever group he is in. The program opens with Wayne Shorter’s “Night Dreamer,” manned by Jason Marsalis on vibraphone, Will Goble on bass and pianist Austin Johnson; essentially the Jason Marsalis Vibe Quartet working band. Potter and Goble lock into a bubbling rhythmic groove as Marsalis’ and then Johnson are featured over the changes. Potter can be heard erupting when needed or gently pulsing forward as the music requires. On Marcus Roberts’ hard-charging “Country by Choice” Potter’s explosive drums are joined by Roberts on piano, bassist Rodney Jordan and the front line of Miguel Alvarado on tenor and Darren English on trumpet. The incendiary Nashville based Alvarado launches into an impressive barrage of fiery lines in his open salvo and Roberts dazzling keyboard work is equally exciting. Bassist Jordan’s solo, pulses on adrenaline and Potter’s drums percolate like bubbling lava in a caldera. This one cooks. Potter wisely takes the temperature down a notch with the 1927 pop classic “My Blue Heaven.” Marsalis, Johnson and Gobles airing out the music on this bouncy stroll through memory lane. Potters easy shuffle in lock step with Gobles walking bass. 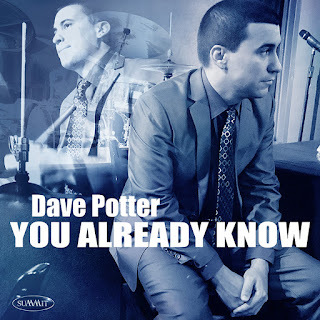 Potter injects some of his own compositional acumen into the mix with “Ratio Man.” This line-up includes pianist Louis Heriveaux, the bassist Craig Shaw and a returning Alvarado on soprano saxophone. Heriveaux is the one to listen to here as he spins serpentine lines through the maze of rhythmic changes provided by Shaw and Potter. The same band returns to the more traditional straight-ahead jazz tackling Benny Golson’s classic “Whisper Not,” with the front line of Alvarado on tenor and Andy Sioberg on trumpet. Heriveaux’s sparse comping is a delight and his solos revelatory without any flash. Soiberg’s trumpet a bit tentative to my ears and Alvarado lays back for the most part. The same group tackles Bobby Watson’s “Beatitudes” later on in the album. Heriveaux, again shines on a shimmering solo and Potter allows himself a brief roiling drum solo over the repeating drone of the two horns. On Monk’s “Played Twice” Potter returns with Marsalis, Goble and Johnson to attack this quirky tune. The in-sync intuition of this group is apparent as they navigate Monk’s musical chicanery with practiced ease. Johnson’s piano is light and fluid, no doubt strongly influenced by Marsalis’ equally effervescent vibraphone style. Through it all Potter finds a way to add his own accents-stabs, splashes and rolls- at complimentary points. Bassist Rodney Jordan’s plucky bass opens Potter’s “I’m Going to Heaven and You A’int” a lowdown dirty blues that features Jordan and pianist Roberts showing some soulful playing. Potter’s work here is restrained, a ghostly timekeeper, allowing these two masters to wring the emotional guts out of this song. Potter returns with another original “Puppet Master” with Roberts, Jordan, Alvarado and English back. English, a promising talent on the trumpet, draws first blood. His solo a combination of bright jabs and slinky slurs. Listen to how well this group interacts; Alvarado’s deep-throated tenor solo sets out a line of notes that Robert’s quickly picks up; the tenor and piano finding common grounds for discussion. When Alvarado erupts it ignites Potter to respond with his own pyrotechnics in true simpatico. Marsalis’ “Bells of Ascona,” the most evocative song on the album, is a hauntingly beautiful composition that features Marsalis’ tubular vibes ringing like the Church Bells they evoke. Johnson’s piano solo is particularly sensitive. Potter is all brush here and the group is for the most part reverent until Marsalis interjects an excerpt from a Christmas Carol partway through his solo, lightening it up for a brief second. “Last Tune” is an under two-minute vocal summation by Potter, where he introduces the names of his bandmates while the group plays on in the background.